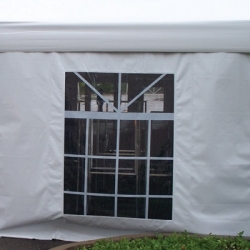 Give the guests of your gathering extra protection with this vinyl tent. It has tough 16 ounce block out vinyl with clear double-polished soft PVC glass vinyl windows. The non-scratch window lines are encapsulated between PVC double polish for a nice look. The tent is fire resistant and UV- rated up to 1,000 hours. The overlapping connecting sidewalls by 15 inches on each side give added coverage. It also comes with 1 inch white plastic clip to effectively secure the sidewalls and prevent flapping in the breeze and grommets are place every 30 inches along the bottom to secure your tent even more.